Since being closed in September 2011, two underwater caves in the Bahamas Lucayan National Park have been reopened. 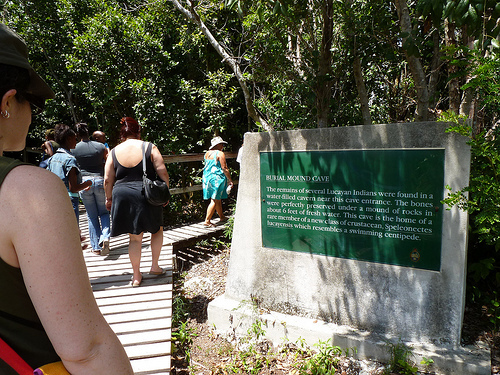 The two caves, Ben’s Cave and Burial Mound, received more than $23,000 in repairs and upgrades to their walkways and viewing platforms which had deteriorated to such a state that the closure of the caves was necessary. The new structures, funded by donations from the Bahamas National Trust, have been constructed with pressure treated wood and, in the more humid areas, recycled plastic wood which should make them last longer and cause less damage to the natural habitat. Part of a 9.6 kilometer (6 mile) long underwater cave system, the caves allow divers to traverse Grand Bahama island, resurfacing on Gold Rock Beach on the south shore. Just east of Freeport, Grand Bahama, the 40 acre Lucayan National Park is one of the most highly visited parks in the Bahamas. There is hope that a museum with guided tours will be added in the future. Caves Closed in Mark Twain National Forest Until 2016!